Nifty opened strong just below the psychological level of 6800 but saw huge unwinding to move towards the lows of the day around 6711. The index thereafter stayed in a narrow range and closed at 6733.10, huge loss of 43.20 points. The broader market was also weak, with 627 advances to 878 declines. Range for the time being at 6650-6850. Call option 6700-7000 added 18.38 lacs huge amount of OI with profit booking seen at 7100 and above strike prices. Put option 6400 added 1.78 lacs huge amount of OI with short covering seen at 6800 and above strike prices. Nifty Open Interest is at 1,53,55,150 down by 7,64,900, with decrease in price, most probably huge long liquidation. Bank Nifty Open Interest is at 14,21,475 down by 71,025, with huge decrease in price, most probably long liquidation. FII’s sold huge 15.35 lacs Futures, mostly long liquidation, as their net OI decreased by 4452 contracts (includes 46359 longs to 77055 shorts for the day) and the average price per contract comes to around 6709.43. FII’s future open contract as on date is 355997. 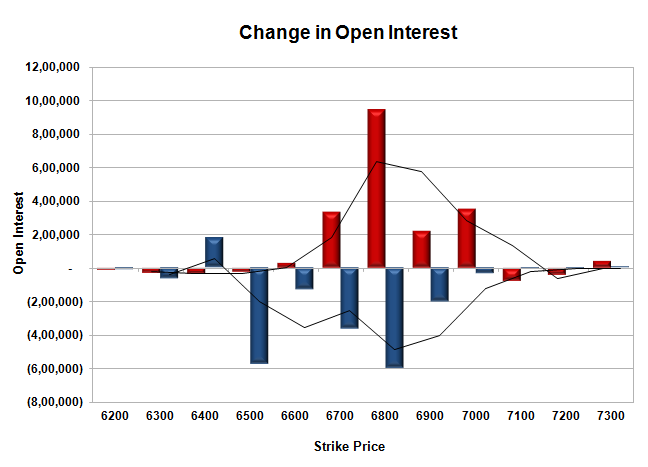 PCR Open Interest (Volume) has dipped down to 1.278. 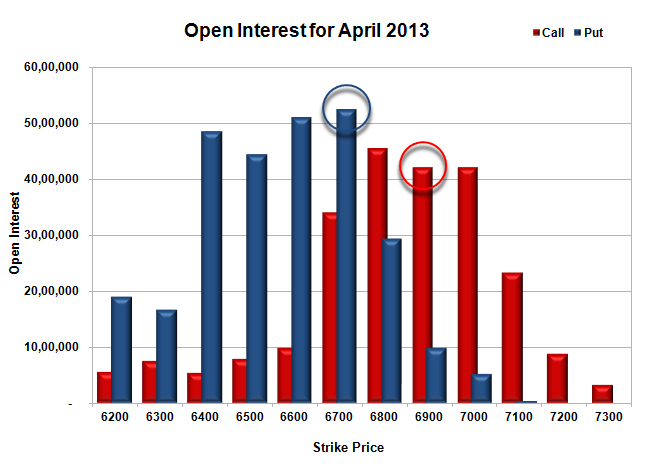 Initial and best support at 6700, with highest OI of 52.43 lacs and below that at 6600 with huge OI of 51.12 lacs. Best resistance is at 6800 with OI of 45.59 lacs and above that at 6900 with OI of 42.15 lacs. 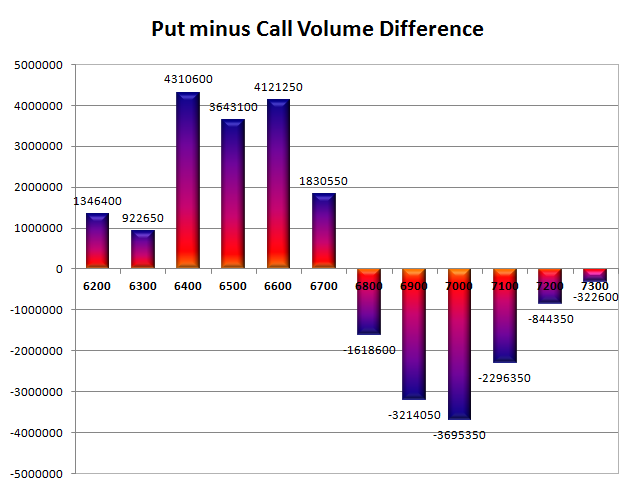 Day Range as per Option Table is 6696 - 6799 and as per VIX is 6621 - 6845 with 6753 as the Pivot.